I have carefully reviewed the available documents from the scoping study, including appendix M on the 11/12th street sub-alternative), and have come up with a proposed routing, which would achieve the goals of the proposed 11th/12th street routing (namely providing high-quality transit service to Uptown and Whittier and interfacing with the existing light rail system in such a way as to allow cooperative operation), while at the same time better preserving the community and traffic patterns (and thus businesses) on major streets in Whittier. My proposed routing (which can be found in Google Maps form comparing it to the studied alternative routing HERE) would follow the regular 3C routing through the 29th Street Greenway trench and turn northbound onto Blaisdell Avenue. There would be a station in the trench immediately before the turn began, probably between Pleasant and Pillsbury avenues. The proposed LynLake station would remain the same. After turning on to Blaisdell, the routing would continue northbound in a trench up to the intersection with Franklin Avenue, where it would turn at-grade into the Plymouth Congregationalist Church's parking lot. As it currently stands, this parking lot covers close to half of the block. 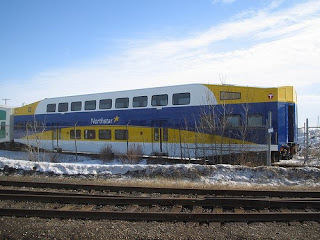 After turning approximately 45 degrees, there would be a station, and after the station, it would execute a corresponding turns to put it onto Nicollet Avenue, heading northbound, on which it would cross I-94 and assume the regular 3C sub-alternative routing. By placing the two stations off of Blaisdell (in the Parking lot on Franklin/Blaisdell and the Greenway trench), the need to fully shut down traffic on either Blaisdell or 1st Avenue could be avoided. If project budgets allow it and/or ridership justifies it, a below-grade station could perhaps be added at Blaisdell/26th street. I would appreciate it if you would please consider my proposed routing, because I believe that it may solve many of the issues regarding the relations between the LRT and the Whittier neighborhood. A Mixed Bag: NIMBYism falls flat in St. Paul, Biden Makes a Promise, Southwest LRT Opposition, and more! First off, the St. Pauls City Council voted on Wednesday to approve the final design for the Central Corridor, including the maintenance site in the Diamond Products building! w00t! Failure for NIMBYs! Success for urbanism! Last week Vice-President Joe Biden spoke in St. Cloud in front of a crowd of about 400 people. He promised that he would secure federal funding for the Northstar extention to St. Cloud. Though he didn't give specifics, this is probably indicative of the new administration's dedication to seeing mass transit get properly funded. Bidding is out for the platform extensions on the Hiawatha LRT, as well as 17 new cars and the new station in Bloomington, so look for this in the future! Apparently, the Whitter Alliance has passed a resolution in opposition of ALL the newly-proposed 3C sub-alternatives for the Southwest LRT. No vote was passed in opposition or support of either the 3C or 3A routes, presumably because neither had a clear majority. I personally think that a blaisdell route as per the below map is by far superior to any other routes (I created the map below out of a 3C sub-alternative that I created). CARAG, on the other hand, has passed a resolution in favor of the 3C route. On the below map, the route I propose is shown in blue, while the 3C sub-alternative is shown in red. Note: The furthest station west (Lynlake), while appearing red, is in the same location for both routes. The Saint Paul city council unanimously passed a resolution granting Thune two weeks to clarify his arguments and to look into other locations for the maintenance facility. If the location of the facility is changed, the project completion date will be pushed back about one year. Any resident of Saint Paul should contact their ward's city council member immediately to voice their opinion on the urgency of this project. Don't let a few NIMBYs make the whole city wait! The council will vote on relocating the facility on March 18th. Thanks for reading, and contact your council members! An article appeared in yesterday's Pioneer Press about Lowertown residents opposed to the location of the storage and maintenance facility for the Central Corridor's rolling stock: the old Diamond Products building two blocks east of the line's terminus at the Union Depot. This is in addition to some concerns voiced last week regarding the cuts to the streetscaping budget for University Avenue in order to counteract inflation and the costs of rebuilding the University & Lexington intersection. There is hope that some funding may be diverted from St. Paul's municipal budget to fill the gap, though it will require the approval of the state legistlature. The big development here is city council member Dave Thune's support of the NIMBYs, setting off alarms in the offices of Peter Bell, the met council chairman (often seen as the driving force behind mass transit in the region) and mayor Chris Coleman. Thune remained adamant that he represented the views of all of St. Paul, not just a select group of Lowertown residents, though a Pioneer Press poll shows only 15% of readers supporting Thune's proposal to delay the line until a new location for the mainenance facility can be found. May I remind you that the new mainenance facility will only be for regular mainenance and all major overhauls will be done at the main facility on the Hiawatha Line, that the facility will be entirely indoors, and that the site is currently occupied by a vacant warehouse. It's really amazing to see a city council member change positions so suddenly on what is really the only hope to revitalize St. Paul's stagnant downtown. This is absolutely phenomenal news, as it will keep the Central Corridor moving forward, even while the FTA has continued to withhold funding until the MPR issue is worked out. Even better, preliminary engineering on the Southwest LRT can begin on some parts of the line, even as the Draft Environmental impact Statement is still being finished (due out this fall). Hi, my name's Drew, I'm 17 years old and live in south Minneapolis. I'm very interested in mass transit, sensible and sustainable land use, and just urban development in general. I created this blog as a place to post updates and commentary on mass transit in the Twin Cities. Right now there's really not anywhere online where this information is easily accessible, as it is scattered about between various government agencies, and developments are often hard to follow, since news outlets don't always pick up on it. Minnescraper is a valuable resource, though the information is often scattered among the forums and buried. My goal here is to present it in an organized, up to date fashion. I may include some commentary on things unrelated to mass transit, and this may also function as a personal blog at certain points.